The Indian Space Research Organisation (ISRO) completed the PSLV-C45/EMISAT mission on 1 April and placed an Indian electronic intelligence satellite in the low-earth orbit. The satellite was developed jointly with the Defense Research and Development Organisation (DRDO). EMISAT was launched along with 28 other cubesats and nanosatellites from Lithuania, Spain, Switzerland and the USA. ISRO has now released footage from the launch and onboard cameras during the mission in a new tweet. The video shows the new Polar Satellite Launch Vehicle (PSLV) variant, the PSLV-QL, lifting off from the Satish Dhawan Space Center in Sriharikota. 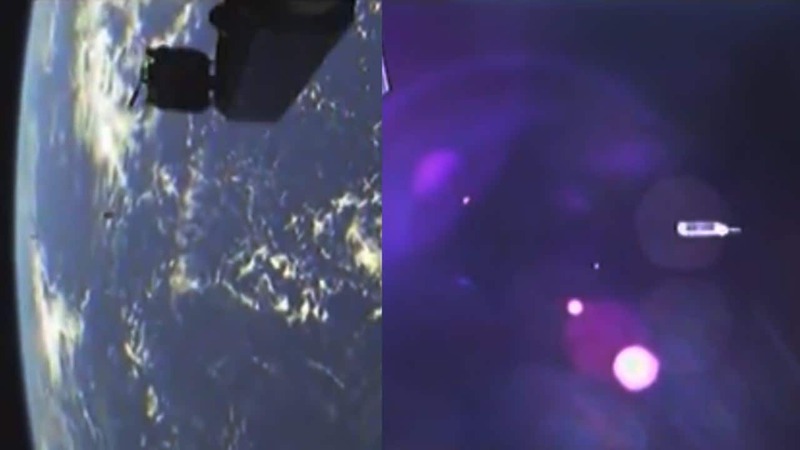 Separation of the strap-on motors, the ignition, burning out and the separation of the second and third stages, separation of EMISAT and the 28 other small satellites are all visible from different cameras from the ground and onboard the PSLV. The PSLV-C45/EMISAT mission is also special for ISRO in many ways. The 180-minute-mission switched between three different altitudes in low-Earth orbit for the first time. It is also the first test of the PSLV-QL rocket variant, which has four additional strap-on boosters to give it a huge additional thrust during liftoff. The mission also hosts three experiments from Indian students and startups in the rocket's fourth stage (PS-4), which is currently "still alive" and orbiting the Earth at an altitude of ~500 kilometres. The PS-4 was modified to house and power these experiments for 5-6 months in the microgravity environment that the used orbiting rocket provides. Indian startup Exseed Space made history in December 2018 becoming the first India private company in space. With the PSLV-C45 mission, it has now also become the second private company from India in space with its Automatic Packet Repeating System (APRS) payload which is part of an amateur radio network. ISRO Chief K Sivan said in an address after the mission was completed on 1 April that a viewing gallery was inaugurated with the launch by 1,200 viewers, who watched the launch live in Sriharikota. This number will be bumped up to seat 5,000 viewers in May's launches of PSLV-C46 and PSLV-C47, he added.